Issued at 4:42 pm Friday, 5 April 2019. Weather Situation: A weak tropical low within the monsoon trough is expected to move across the northern Gulf of Carpentaria on Saturday, approaching the northeast coast on Saturday evening. Heavy rainfall, squally showers and thunderstorms are expected to develop as the low moves closer on Saturday. HEAVY RAIN which may lead to FLASH FLOODING is possible for the northeast Arnhem District on Saturday. 24 hour totals of 50 to 90 mm are expected, with isolated falls of up to 150 mm. 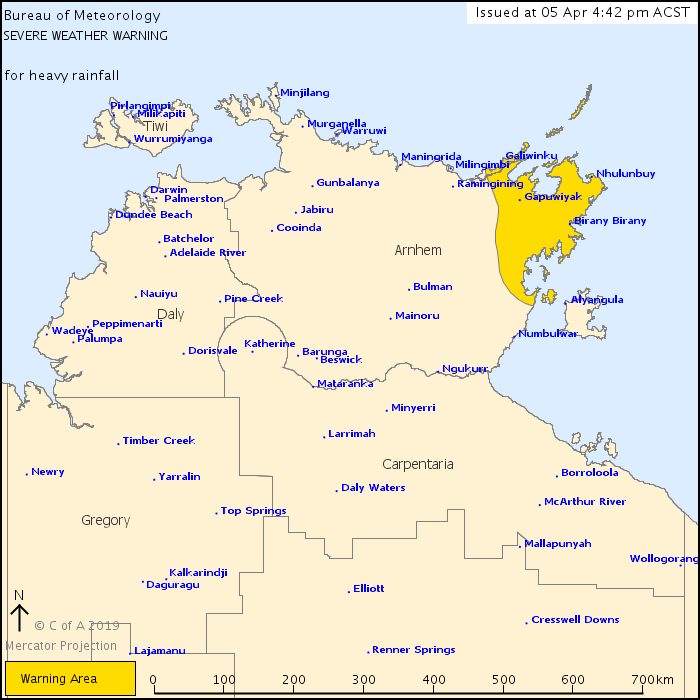 Locations which may be affected include Nhulunbuy, Galiwinku, Gapuwiyak and Birany Birany.